Peppermint tea is made from the dried leaves of the peppermint plant. During pregnancy, peppermint tea can provide relief from common early pregnancy symptoms. It is important to know how much peppermint tea is safe to consume and which side effects you may experience. Peppermint tea is an herbal tea, which means that it is naturally caffeine free and can be enjoyed without the adverse effects of caffeine during pregnancy. According to the University of Maryland Medical Center, peppermint can help calm your stomach muscles, which can help relieve flatulence, nausea and vomiting that can occur during early pregnancy. In addition to relaxing your stomach muscles, peppermint tea also relaxes your sphincter, the muscle between your stomach and esophagus. This can cause acids from your stomach to flow back up, making heartburn that can occur during pregnancy worse. Peppermint tea can also interact with antacids, so you may want to avoid drinking it if you take any. 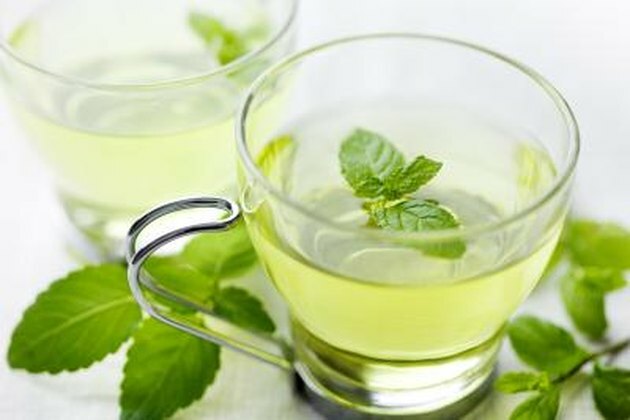 The University of Maryland Medical Center states that peppermint tea appears to be safe to drink in reasonable amounts. You can make peppermint tea by steeping one teaspoon of dried peppermint leaves in one cup of boiling water for 10 minutes. Drink one to two cups of peppermint tea a day or follow your doctor’s dosage instructions. Although peppermint tea is likely safe in early pregnancy, it is best to ask your doctor first. There is a lack of safety information for many types of herbal teas, and you should only drink them if the benefits outweigh any potential side effects. The American Pregnancy Association states that commercial brands of herbal teas are typically safe, but read the label carefully to make sure the tea does not contain other types of herbs that can be dangerous during pregnancy.